Custom embroidered Denim shirts As low as $17.00 embroidered with your logo. Custom Embroidered Soft Shell Jackets. As low as $32.00 embroidered with your logo. Custom Embroidered Business wovens, & Industrial Work shirts. As low as $17.00 embroidered with your logo. Custom embroidered tshirts, pocketed, long sleeve, pigment dyed & Moisture wicking Tees. As low as $7.70 embroidered with your logo. Custom embroidered Carhartt Jackets, Work Jackets, Parkas & Corporate Jackets As low as $34.00 embroidered with your logo. Why choose OMD Custom Embroidery? Wholesale pricing, No minimums, One time set up fee of $25, combine custom embroidered shirts for quantity discounts. Michigan Company. Fast turnaround of 7-9 days. Super rush available 3-5 day turnaround. All prices in our custom embroidery catalog include your custom embroidered logo! And Quick, Courteous, Reliable and Friendly Staff. Embroidered Shirts, Embroidered Jackets, Embroidered Caps and more. Custom embroidered shirts polos golf for business apparel and corporate embroidery. For your business your logo should be the best quality possible. Here at OMD Custom Embroidery we do all our embroidery digitizing in house to be sure your custom embroidered logo is perfect. It is more than using state of the art software, it takes an artists touch to turn your graphic logo into a 3D masterpiece! Our digitizer, learned from one of the best digitizers in the business, Walter Floriani and advanced in her skills with technology over the years. She has been digitizing for more than 20 years....more about our digitizing process. 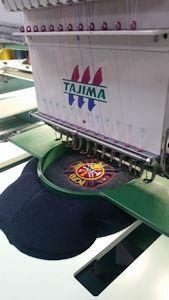 Custom Embroidery for your business: Our primary focus is Corporate custom embroidery business apparel. We sharpen our pencil to give you the best wholesale prices, no miniumuns and a low first time set up fee of just $25. We own multi head industrial embroidery machines, Tajimas. The best in the industry....more about OMD Embroidery. 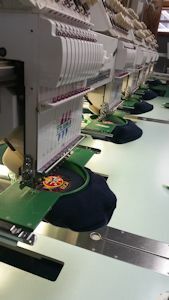 At OMD Embroidery we offer the best Custom Embroidered Carhartt Sweatshirts , Embroidered embroidery Polo Golf Shirts, Custom embroidered t-shirts, embroidered Sweatshirts, custom embroidered Carhartt Jackets, and custom embroidered Caps hats for Corporate Apparel, Small Business and individuals. Embroidered Clothing apparel for every need. Fundraiser and family events as well. Our friendly staff is available to assist you! Visit our Custom Embroidered Corporate Apparel today.